It was an evening in January 1846 when a young peasant girl from Normandy discovered that her life was about to change forever. 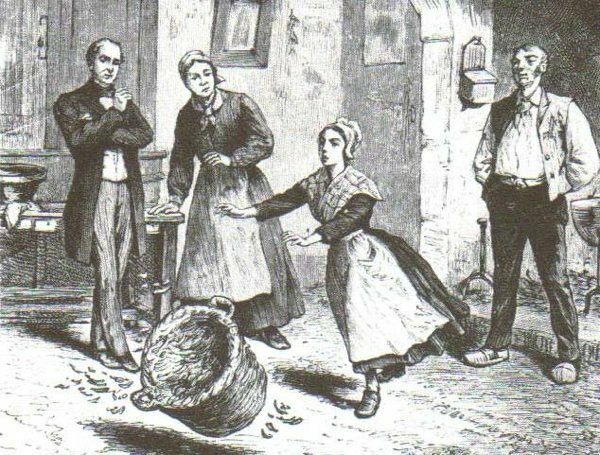 Fourteen year old, Angelique Cottin, among other girls were weaving away silk gloves on what was a rather large oak frame. When, all of a sudden, the heavy wooden frame started to move on its own. The young ladies attempted to keep the frame stationary, but were unable to do so. In a complete state of terror they called out to their neighbor for help, but he refused. Out of his disbelief he told the girls to go back to doing their job. As afraid as they were, the girls obeyed and continued with their work. The wooden frame remained still as each girl, one by one, approached it until Angelique was near. And then, immediately the frame started to shake again. Even though the other girls were frightened, Angelique was not, but she was however, intrigued. Upon hearing the news of Angelique’s bizarre incident, her parents grew worried that their daughter could possibly be possessed by the devil. They sought help from the church, but the priest denied the Cottin’s request for exorcism. Why? Because his curiosity had the best of him, he wanted to witness the unusual phenomena for himself. Once he saw Angelique’s odd ability happen right in front of his very eyes, that was enough to make him believe that the Cottin’s daughter was, in fact, not possessed at all. Instead the priest urged them to take Angelique to be examined by a medical physician. As time was leading up to her meeting with the doctor, Angelique’s ability heightened more and more with each passing day. The young lady would attempt to sit in a chair, but then the chair instantly was “forced” away. It was also said that with a simple touch, Angelique was able to float a heavy table in the air. The mere act of sleeping became difficult for her, too. While laying down, her bed would start to uncontrollably rock making it impossible for her to get a good night’s rest. Other times as she approached small items, they would dart away from her without any plausible explanation, and this poor girl wouldn’t have to touch any of them. Often, if people were near her they would get shocked without even touching Angelique. After visiting with a few doctors who were baffled by Angelique’s condition, one doctor took the Cottin family to Paris where they met with scientists who were eager to meet with Angelique. Once they conducted a battery of tests, the scientists concluded that Angelique’s ability was indeed the real thing. In 1846 renowned physicist Francois Arago documented that Angelique’s ability was due to electromagnetism, which he wrote about in his publication in The Journal des débats. If any of you have an ability like this, we would love to hear about it! Don’t be afraid…. share your experience! Get a copy of my novel, The Spirit Within on Amazon! ~ Sheila Renee Parker on Twitter: @sheilarparker. This entry was posted in Angelique Cottin, Artist, Author, Books, electromagnetism, Empath, Empowerment, Francois Arago, Kindle, Novels, Paperback, Paranormal, Paranormal Researcher, Poet, Sheila Renee Parker, Supernatural, The Journal des débats, The Spirit Within, Writer and tagged Angelique Cottin, Artist, Author, Books, electromagnetism, Empath, Empowerment, Francois Arago, Kindle, Novels, Paperback, Paranormal, Paranormal Researcher, Poet, Sheila Renee Parker, Supernatural, The Journal des débats, The Spirit Within, Writer by SheilaReneeParker. Bookmark the permalink. Wow! Lucky for her she wasn’t born during Louis 14th. She would have found her way to the “Chambre Ardente”—the burning room. France killed way more than the Salem trials. That is quite frightening! Yikes!! Curious if there’s ever been a scientific inquiry into this. She was very lucky not to be found possessed or a witch. But maybe she was a young witch and just needed training. I’m not talking about an evil witch, but just someone with supernatural abilities. And I know what you mean about witches. There are many good ones out there, with kind, loving hearts who are often misunderstood for their gifts/ abilities. All they want to do is help others by promoting good with the positive energy of love and light. Societal fear has branded many witches as being evil for absolutely no reason at all. It’s truly sad and unfortunate that the misinformed can be so narrow-minded. I can respect that. Were you born to it or were you taught? I’m pretty interested in white magic. It’s always been who I am, in my heart. Even in a past life I was a white witch.